This is one of our chess product which standing on the chess table. As an example, we show you the black chess set which opposite to the brown chess set. 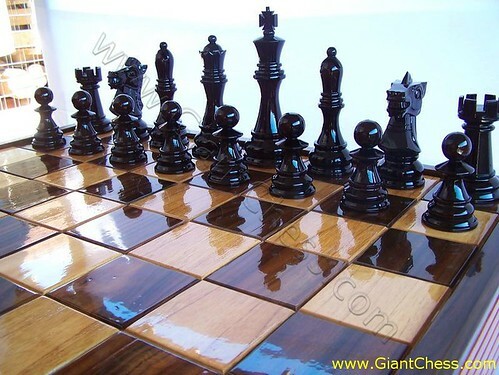 Those black chess set are designed in standard size and commonly meet in chess tournament. Many people collect this kind of chess, save it in their house and release it when they want to play chess with friends, neighbor, or family who is visiting. Those are made of original Teak wood that has dried first. So that, those are durable product for outdoor use in any seasons. To support the chess game, we also provide wooden chess table that has suited squares for the standard chess pieces. The white and black squares will accompany the chess pieces in the game.